Teachers are one of the most influential groups in our society and their importance can’t be overstated. However, there has been a decline in students majoring in education fields over the past few years which is why Southern Utah University has been working with the #BeATeacher movement to spread awareness and recruit students into the education profession. “Recently, we’ve seen similar declining trends of enrollment in traditional teacher education programs,” said Dr. Shawn Christiansen, SUU’s Dean of the College of Education and Human Development. One of the goals of the campaign is to change the narrative about teaching as a profession. Caitlin Jones earned her Bachelor’s of Science in Elementary Education with an emphasis in English as a Second Language from SUU in 2014. She soon started working at a Title One Elementary School in Salt Lake and knows first hand the challenges and rewards of being a teacher. At SUU, incoming education students are encouraged to share their memories of impactful teachers using the hashtag - #BeATeacher. This helps foster a sense of community and reminds people of those who have influenced them along the way. 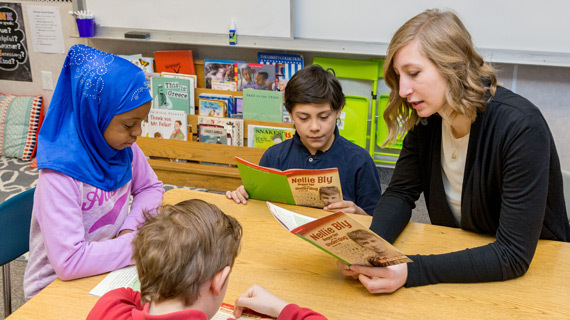 Created by Weber State University, the #BeATeacher campaign is an incentive supported by the Utah Council of Education Deans (UCED) which serves as an advisory and action committee for teacher education state-wide. The UCED consists of college education deans from across the state with a “purpose to positively impact the development and ongoing effectiveness of teacher education programs to meet Utah’s need for high quality, licensed teachers today and in the future.” No other state has a similar council of college deans addressing education issues. The College of Education and Human Development prepares caring, competent and knowledgeable professionals empowered to be productive citizens, socially responsible leaders, high achievers and lifelong learners. The mission of the Department of Teacher Education and Family Development is to prepare new teachers who possess the knowledge, skills and dispositions necessary to positively impact learning for all students in diverse classroom environments.